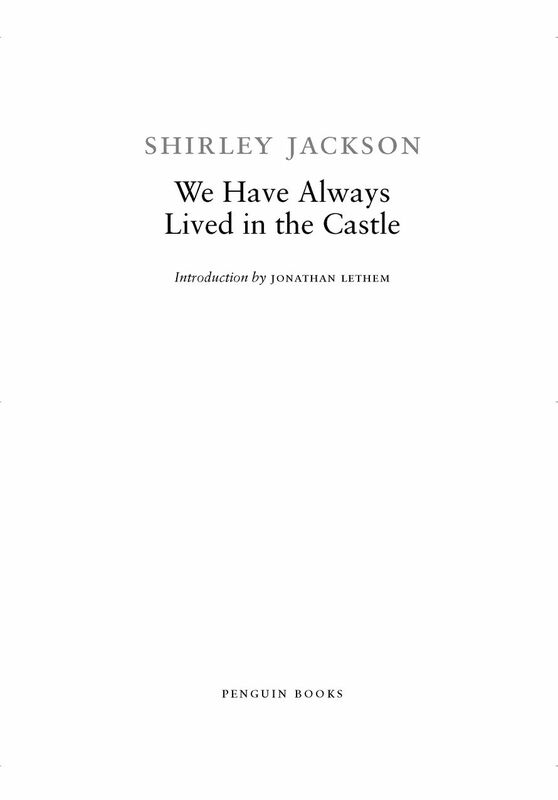 READ We Have Always Lived in the Castle FREE online full book. (Penguin)âare characterized by her use of realistic settings for tales that often involve elements of horror and the occult. (Penguin) are her two works of nonfiction. She died in 1965. (Penguin) is a collection of stories, lectures, and part of the novel she was working on when she died in 1965. The scanning, uploading and distribution of this book via the Internet or via any other means without the permission of the publisher is illegal and punishable by law. Please purchase only authorized elecontronic editions, and do not participate in or encourage electronic piracy of copyrighted materials. Your support of the author's rights is appreciated. âcounting seconds to the inevitable widening of my victim's eyes: they'd not only read it, they could never forget it. I'd then happily take credit as a mind reader, though the trick was too easy by far. I don't think it ever failed. Though she teased at explanations of sorcery in both her life and in her art (an early dust-flap biography called her “a practicing amateur witch,” and she seems never to have shaken the effects of this debatable publicity strategy), Jackson's great subject was precisely the opposite of paranormality. The relentless, undeniable core of her writingâher six completed novels and the twenty-odd fiercest of her storiesâconveys a vast intimacy with everyday evil, with the pathological undertones of prosaic human configurations: a village, a family, a self. She disinterred the wickedness in normality, cataloguing the ways conformity and repression tip into psychosis, persecution, and paranoia, into cruelty and its masochistic, injury-cherishing twin. 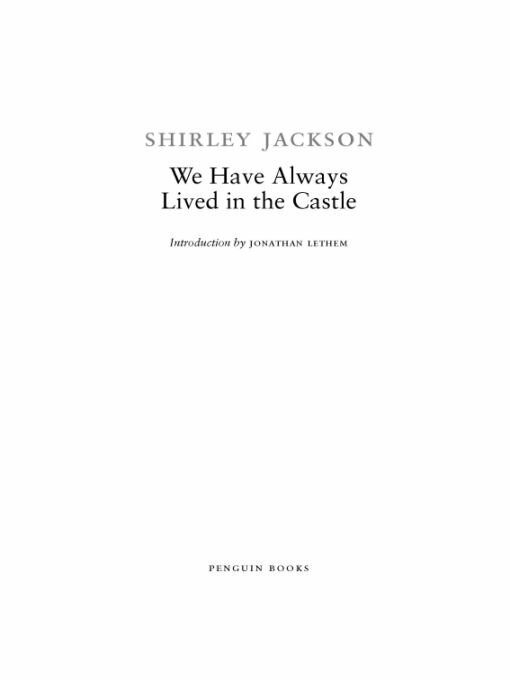 Like Alfred Hitchcock and Patricia Highsmith, Jackson's keynotes were complicity and denial, and the strange fluidity of guilt as it passes from one person to another. Her work provides an encyclopedia of such states, and has the capacity to instill a sensation of collusion in her readers, whether they like it or not. This reached a pitch, of course, in outraged reactions to “The Lottery”: the bags of hate mail denouncing the story as “nauseating,” “perverted,” and “vicious,” the cancelled subscriptions, the warnings to Jackson never to visit Canada. which I think is her masterpiece. , Jackson revisits persecution with force and a certain amount of glee, decanting it from the realm of objective social critique into personal fable. In a strategy she'd been perfecting since the very start of her writing, that of splitting her aspects among several characters in the same story, Jackson delegates the halves of her psyche into two odd, damaged sisters: the older Constance Blackwood, hypersensitive and afraid, unable to leave the house; and the younger Merricat Blackwood, a willful demon prankster attuned to nature, to the rhythm of the seasons, and to death, and the clear culprit in the unsolved crime of having poisoned all the remaining members of the Blackwood family (apart from Uncle Julian). The three survivorsâConstance, Merricat, and the frail and daft Uncle Julianâdwell together in their grand house at the town's periphery, rehearsing past trauma and fending off change and self-knowledge. Constance cooks and cleans in a kind of time-struck ritual observance of the missing family's existence, while Merricat makes her magical forays into the woods and her embattled shopping trips into the center of town, there to contend with the creepy mockery of the village children, who propagate the family history of poisoning as a singsong schoolyard legend. Uncle Julian, dependent on Constance's care, putters at a manuscript, a family history, in an attempt to make sense of the rupture that has so depopulated his little world. Julian's a kind of reader's surrogate, framing questions (“Why was the arsenic not put into the rarebit?”) and offering thematic speculations (“My niece is not hard-hearted; besides, she thought at the time that I was among them and although I deserve to dieâwe all do, do we not?âI hardly think that my niece is the one to point it out.”) that frame our curiosity about the events that Merricat, our narrator, seems so particularly eager to dismiss.